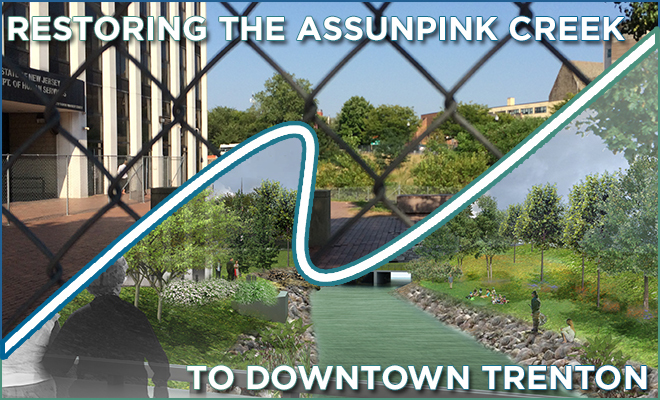 As part of our local work, New Jersey Future has partnered with the City of Trenton to advance and highlight the redevelopment around one of the city’s natural and cultural assets, the Assunpink Creek in downtown Trenton. Learn more about the five different projects taking place around the Downtown Assunpink Creek: the Douglass House renovations, Mill Hill Park signage, Assunpink Creek Daylighting, rehabilitation of the Jackson Street Bridge, and the future of the historic South Broad Street Bridge. If you were unable to attend the community meeting on Sept. 15, you can learn more about the City of Trenton/US Army Corps of Engineers creek restoration project by viewing the presentation slides. Please contact Jane Rosenblatt (jrosenblatt njfuture org) with any questions (609) 393-0008 ext 110. Landscape design plans have been drafted for the restoration of the Assunpink Creek between S. Broad and S. Warren streets and construction may begin as early as the end of this year. The NJDEP has approved the permits necessary to daylight and restore Trenton’s Assunpink Creek. New Jersey Future has been involved with the project. A new study highlights opportunities in Trenton where green infrastructure can be incorporated in order to reduce stormwater runoff. A community meeting in Trenton about the Assunpink Creek daylighting project highlighted safety and access concerns and yielded a wealth of suggestions. The U.S. Army Corps of Engineers and the City of Trenton are preparing to undertake a habitat restoration project that adds parkland and natural space. The U.S. Army Corps of Engineers and the City of Trenton are preparing to present their plans to restore the Assunpink Creek at a Sept. 15 meeting. Presently located within Trenton’s Mill Hill Park and occasionally opened for tours, the historic Alexander Douglass House once served an important role in the birth of our nation, when it was used by George Washington in 1777 for his Council of War following the Second Battle of Trenton. Jackson Street Bridge in the winter. Photo courtesy of Amanda Seelig. First built in 1888 by the New Jersey Steel & Iron Company, the Jackson Street Bridge was converted into a pedestrian bridge nearly a century later. The bridge connects the Mill Hill neighborhood of Trenton to Mill Hill Park and the city’s central business district.